Frank I hope you don't mind but I would like to keep this as a pinned post for a day or two so it doesn't get lost. Here are my thoughts on why the western track won out. I too wish to apologize for not recognizing the writing on the wall sooner. The weather is a complex, fluid, dynamic system that humbles all who attempt to understand it. I have a lot to learn, and realize that the best learning comes from failures, so while I feed myself my humble pie this morning I will learn from it. rb924119 wrote: After taking a brief look at H5 to see where I went wrong, of all the pieces to completely fall apart or potentially go wrong, I did not think it would be the EPO. That was the dagger in my forecast. And without being able to do any follow-up analysis during the week, I was forced to just look quickly at things under the (false) pretense of my initial and long-standing ideas. Had we kept the EPO in a negative state, the outcome would be very much different, especially for northern and western folk. The other components of my initial thoughts were largely on track, however. After reading Rays brief reflective analysis I decided to look back at it as well and add a few things. They say hindsight is 20/20 and that phrase couldn't be more apropos here. We always say that the result of the pattern is the sum of all the moving parts. Many of us who attempt to examine evaluate and predict the pattern, both long term and medium term, discuss such features as the ENSO region, SOI, MJO, Stratosphere, QBO, teleconnection(AO, NAO, EPO, PNA), etc. etc. Its these areas that we examine individually to see if they are in phase or state that could benefit us in the NE or if they are in a phase/state that would hurt us. Once examined individually this is what we attempt to sum up to come up with an idea of weather or not the sum of all these parts will add up to a pattern conducive for cold and snow or not. When they all seem to align together, or at least the majority of them, it becomes much easier for us as well as modelling to predict the outcome; however, when they don't align you now have to figure out what are the individual weights given to the positive and negatives and what is the final result. Before I go further let me say that the pattern has changed. It is no longer the pattern we saw between Dec 10th and approx. Jan 10th. This has come in large part, if not in entirely from the down welling effects of the SSWE(sudden stratospheric warming event) that too place late Dec into early Jan. Because of this we will have cold and at times extreme cold, as well as snow chances. You need the cold in order to get the snow. Now remember...sum of all moving parts. 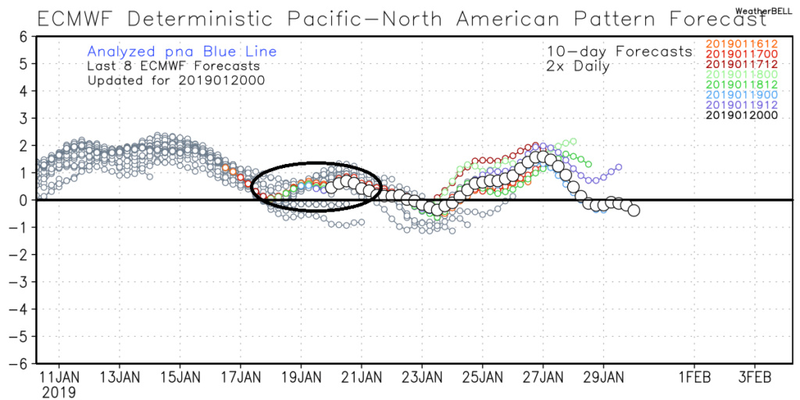 We still have resistance, most notably in the form of the MJO. It has been a fly in the ointment almost the entire winter. The phases for which it has amplified in have been horrendous since early Dec when it decided to take a slow Sunday drive, MUCH longer than forecast or predicted, through the warm phases. 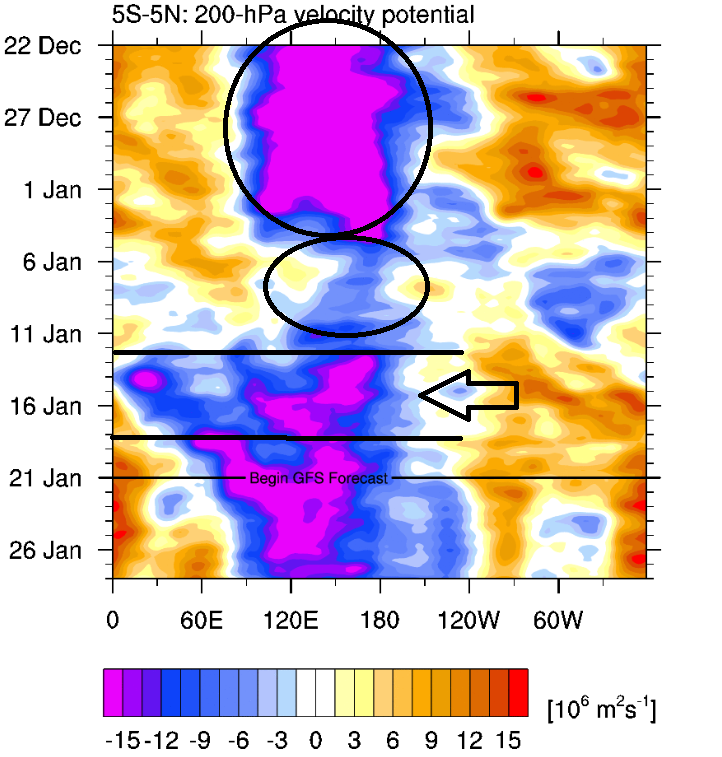 We had a brief favorable MJO in phases 7-8 between Jan 3rd-12th, but very quickly it traveled through the NULL phase and re-emerged out in Phase 4 as of a few days ago. The result of this can also be seen in the shift back to a weak positive state of the SOI for the last 4-5days as well. So here is where I bring this back around to the current storm and the busted forecast by myself. Once we started to get closer I zeroed in on a geographic area narrowed to this: for the most part the CONUS. .....I think the result of the basin wide El Nino and the warmer waters off the E African coast, combined with the contrastingly anomalously cold waters surrounding most of Australia(esp W coast) vs the warm anomalies due N of this in the Bay of Bengal, Eastern Sea, and western Pac has resulted in the preference for convection or upward motion in the MJO phases of 3-6 during the Dec stretch. Combine this with the state of the strat at that time and what you got was anomalously strong upward motion in said MJO phases which worked more in concert with the state of the strat. Now also ironically this same MJO pulse, the intensity of which was not well foreseen, fed back into the upper levels and eventual strat leading to the also anomalously strong Strat warming event that has taken place. Unfort The prolonged nature of the MJO pulse in less than favorable phases led to a prolonged response to the Start itself. In turn seemed to delay the Strat changes that would then feed back down to the trop leading us to the propensity to develop high lat blocking pattern. BUT it does appear that the results of it all will still bear fruit for the final days of Jan and hopefully well into Feb as the Ensembles are looking phenomenal in that regard. Ill take the wait and see approach but I believe the favorable pattern I see before me is for real. My thought was with such extremely cold air to our immediate north and a nice arctic HP modeled consistenly to the north I thought for sure the cold air would press and shift our storm track S&E and the colder solns as indicated by the UKMET esp would ultimately win out. So why didnt that happen? What did I miss? With the MJO in the phase 4 domain the SE ridge wants to flex. 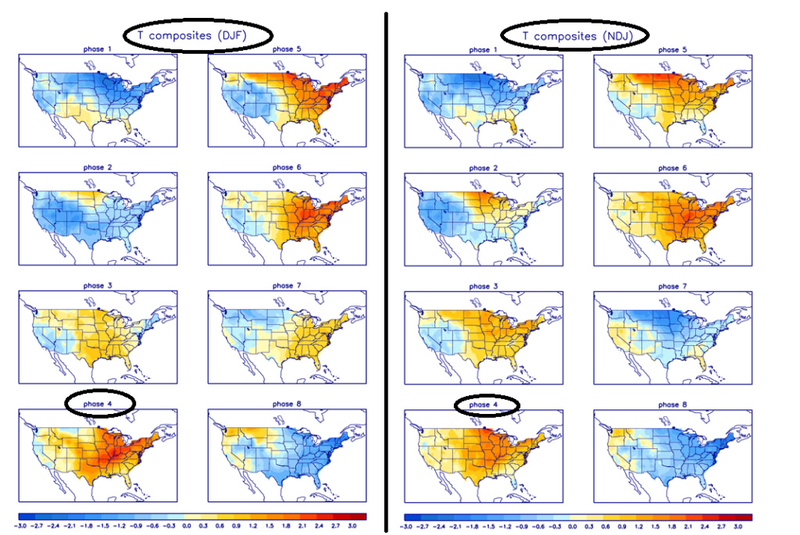 You can clearly see it on the temp composites for NDJ and DJF. Phase 4 is a warm phase. Now the reason it really isn't warm before and after is the Strat is still also influencing the overall pattern keeping us cold. 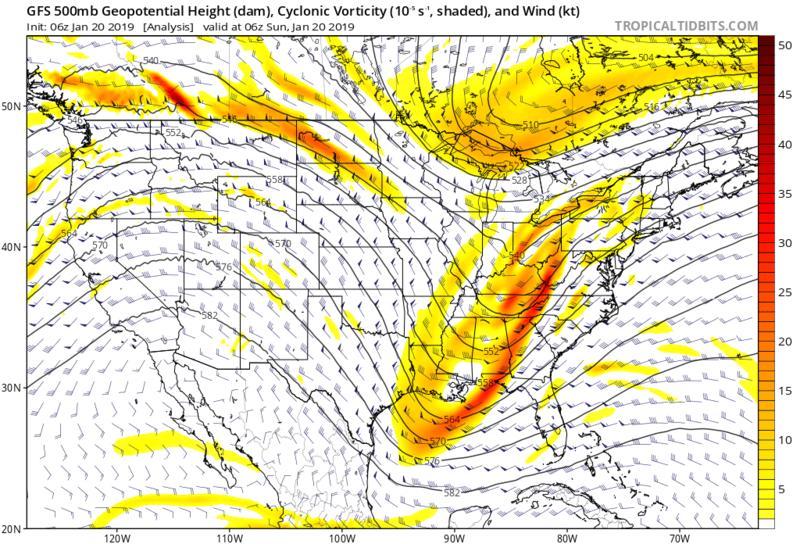 However, when a strong system drops into the CONUS as this one did as it digs the relase of latent heat into the atmosphere wants to amplify the Ridge out ahead of it. With the MJO in the phase it is in its like opening up the door wide open for this to happen along the EC. But I though there would be the cold air resistance. Why was the amplification out ahead of the storm sufficient enough to allow a storm track to the west rather than off the coast towards the BM? Well back to what ray mentioned. The teleconnections were all either against us or not helping at all. 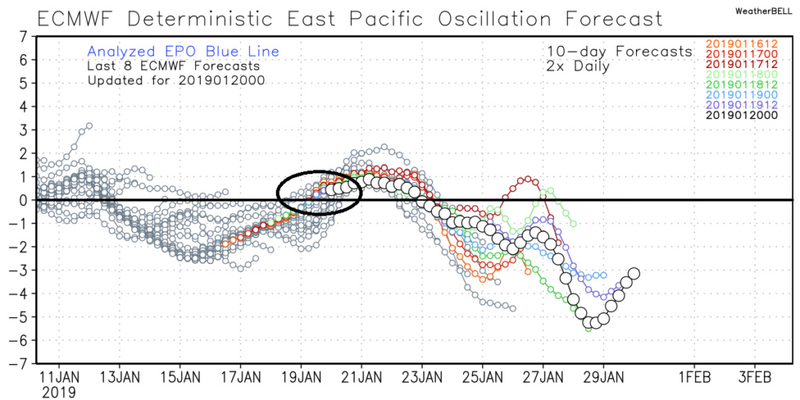 The AO was positive, the EPO moved to positive, the NAO was positive, and the PNA while positive weakened (which honestly I believe actually helped to prevent dreaded earlier phase models were showing for a time that led to an all out GLC). So 3 of 4 teles were either neutral or against us in the fight against the MJO phase which wants to promote ridging in the east. Now I will let someone smarter than me tell you if its the MJO that is the cause of the aforementioned teles to be in such a crappy state for this system or not, but I personally believe it is the reason. And its the Sea surface temp anomaly configuration(see above) that is the reason why we cont to have the MJO pulse through these unfavorable phases. Briefly regarding the up coming 10days or so. I worry that the 25th-26th system ends up similar to todays system for the exact same reasoning above; however, just briefly looking at the forecast for the teles maybe not. The jury is still out on that. I too will likely lay a little low over the next few days and monitor the trends. I still think I will end up above normal for snowfall this year, but the winter grade cannot exceed a B for me. 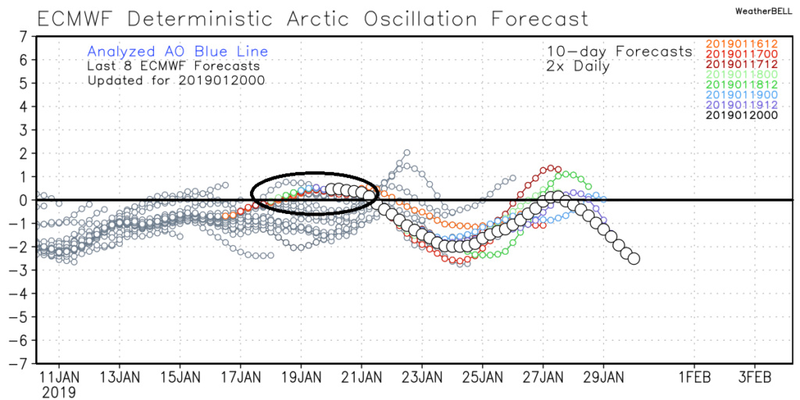 And the only way I can still see me grading this winter as a B would be if some absolutely incredible things happen going forward which because of the strat changes I believe is possible, BUT the MJO will have to behave. Everybody did the best they could with this very complex setup, especially with thermal profiles. It would help if the models were somewhat consistent and we could rely on them within 72 hours instead of 24 hours. Great write up Scott. Always love when you take the time to clearly explain why we didn’t get our snowstorm. Hopefully in the near future this will change and we can all cash in on the white gold this season. As always, great work Doc and I thank you for the time you put in with your interpretation of the models.We are in a slump right now, like Aaron Judge going 0 for 20.Still plenty of time to turn this thing around. The crew here didn't do too bad at all up here in the LHV.We got 5 inches of snow then the FR afterwards. The MJO was in a very low amplitude phase 4 during our storm event. Like I told Mikey, the MJO does not enter a particular phase and our pattern flips a switch. There is typically a 1-2 week delay, which is why I am concerned our pattern toward the 2nd week of February may turn unfavorable. MJO is forecasted to get into higher amplitudes of phase 4 then go through phases 5 and 6 again. This is where my concern stems from for mid-February. We are in the best pattern of our winter right NOW. If we do not capitalize on anything over the next 10-15 days we may very well have historic lows for seasonal snowfall. My belief is the active Pacific Jet fooled us again. 150+mph jet streaks crashing into the west coast of the U.S. will have significant consequence on the PNA, EPO and even AO. Everything just rolls forward. I am like a blind rooster when it comes to weather knowledge, but even a blind rooster finds an acorn once in a while. I am sure we will see some snow action before Ground Hog Day. Hello. Thank you very much for this write-up. I had a question about the MJO. You said that the SST anomalies might be influencing the location of the MJO convection. Sorry if it's a dumb question, but here it goes: Wouldn't convection be favored in areas of warm SST anomalies, just like hurricanes/tropical storms need warm water? So that would mean preferred convection in phases 1-2 and 7-8, since those are the areas of warmest water. Obviously I'm missing something, and I get the feeling that the difference in temp is also important. But with my lack of deep weather knowledge I can't connect the dots. I was just wondering why convection is favored in phases 3-6 when those are the location of the cold SST anomalies. SnowForest wrote: Hello. Thank you very much for this write-up. I had a question about the MJO. You said that the SST anomalies might be influencing the location of the MJO convection. Sorry if it's a dumb question, but here it goes: Wouldn't convection be favored in areas of warm SST anomalies, just like hurricanes/tropical storms need warm water? So that would mean preferred convection in phases 1-2 and 7-8, since those are the areas of warmest water. Obviously I'm missing something, and I get the feeling that the difference in temp is also important. But with my lack of deep weather knowledge I can't connect the dots. I was just wondering why convection is favored in phases 3-6 when those are the location of the cold SST anomalies. Im at work today so it will be tough to answer in detail, but I will try to over the next day or so. Its a great question. To get your brain turning google the term walker cell, and Hadley cell, and trade winds. Unfort the links I have with some great definitions and graphics for this arent operating due to the govt shut down as they are NOAA and NWS sites. The sea surface temps across the equator; not just in the Pacific but also Indian ocean and Atlantic oceans play a major role in where the upward/downward motion (convection/subsidence) becomes favored. Also keep in mind while I showed the sea surface temp "anomaly" map in the write up, in general the sea surface temps are all warm along the equator. Its the difference in the actual temps, sometimes only subtle diff on the order of 1-2*, as well as what the temps are relative to normal west to east, but also North to south of the equator that make the difference when your looking at how the upward and down motion configuration sets up over the equator. 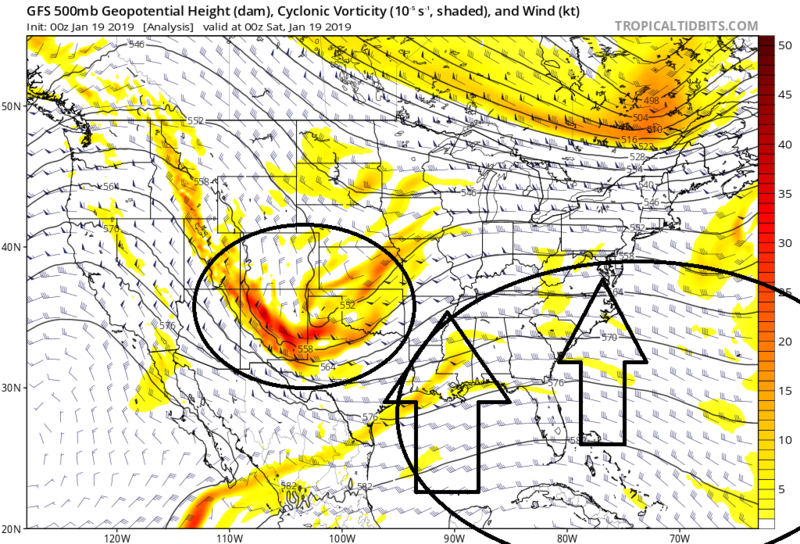 This can also be influenced by whats happening in the upper levels(200mb) as well, ie: where the upper level divergence, and convergence pattern develops. The two are intimately linked to each other, surface and upper levels, and changes in one will influence the other. In the SSTA map I showed I am trying to show that the more basin wide El Nino (warm anomalies across the trop Pac of equal strength as well as the warmer than normal anomalies in the western IO leaves the area in between where I have the rectangles the most anomalous; therefore its the gradients between these temps that have likely led to the the upward motion favored in this area. 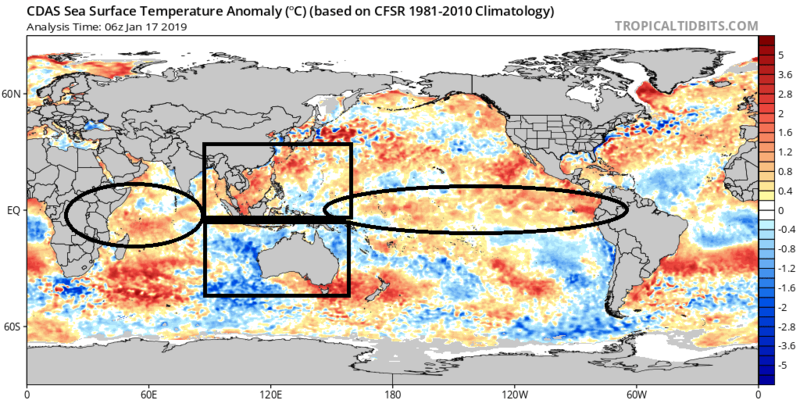 There are other factors playing a role but regarding the SST's Ill try to expand on this going forward. Frank_Wx wrote: My belief is the active Pacific Jet fooled us again. Frank I personally believe the MJO was intimately involved in that jet extension. Here is the 200mb vel potential plot. You can see that with the exception of the small period I have circled between approx Jan 5th-11th/12th when the MJO was in phase 8 the upper level divergence pattern very quickly redeveloped over the unfavorable MJO phases. So while looking at the MJO site it may at first glance appear that it just recently re-emerged out ion low amplitude 4 I believe it was still atmospherically still enhancing the jet extension to the north even though it appeared to be in the null phase. 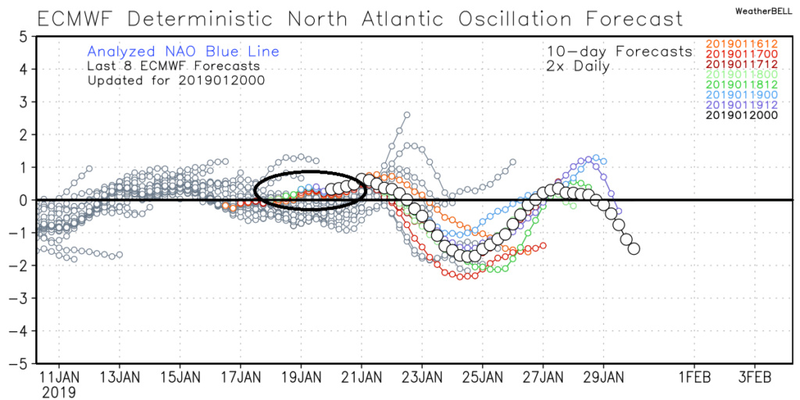 Also if Im not mistaken I dont believe the MJO has such a long lead time as 10-14days to invoke downstream changes. I believe its much shorter than that though I could be wrong. I would think with an MJO moving deeper into phase 4 and forecasted to go into phases 5-6, the jet extension would persist. As shown above, however, it does not look like it will. Frank_Wx wrote: I would think with an MJO moving deeper into phase 4 and forecasted to go into phases 5-6, the jet extension would persist. As shown above, however, it does not look like it will. A novice asking this, but could that be because the coming phase 5 and 6 are closer to the so called COD and not as pronounced as the last phase 5-6 of the MJO? The closer the MJO is to the COD regardless of phase, the less influence it has on weather patterns. With a less amped MJO, other teleconnections can trump it. I would too to be honest. But The effects from the SSWE are still inserting themselves on the big picture. I think the strat effects will cont to throw its punches and at times beat back the effects on the MJO has on the system, but worry that so long as it is in the phase 4-6 with amplitude the MJO still may also be able to counter the strat effects. I still have extreme concern beyond the day 7 time frame, regardless of what the models say, that the effects from the MJO's counter punches will cont to predispose any amplified southern stream system to having a higher than normal chance to track along the coast or west even unless the timing is perfect with the N stream energy rounding the TPV. Even though the MJO is running similarly in time and amplitude through the warm phases as it did in December, the Strat effects are vastly different. To be honest in all likely hood its the only reason we have a chance right now. It, the strat, has clearly has flipped the pattern, but there is still a fight. My hope is that we cont to see the favorable strat effects on our sensible weather by the time the MJO gets back to 7-8. I truly believe that there really has only been two fighters in the arena thus far running the big picture, the MJO and the strat. Thus far the MJO has landed all the big punches and had the winter on the ropes, but the strat ability to help us has allowed winter to surive the initial onslaught without a KO. Now that the strat has thrown some counter punches we have to see if it has shaken off enough of the cobwebs to make a push to even the fight for winter. Hopefully the ref wont stop the fight early because of a TKO by the time the first week of Feb is up. We shall see. 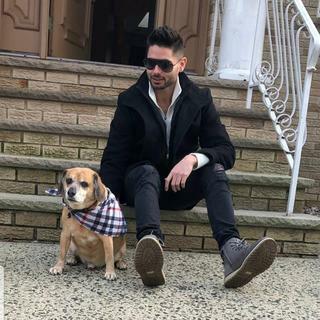 BTW I had a convo with Ray and he would like to add some thoughts to this thread, but needs a little time to do so.